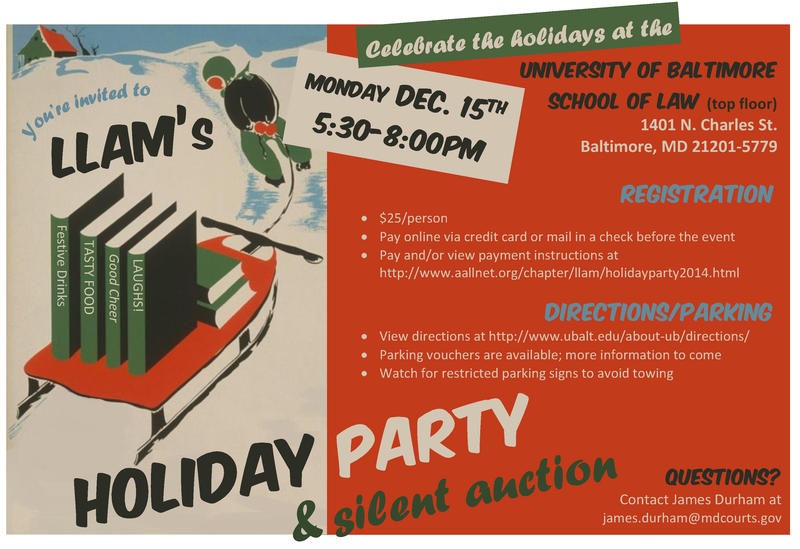 We hope you can join us for LLAM’s 2014 holiday party! CLICK HERE to register and pay online now! When: December 15, 2014, 5:30 P.M. – 8:00 P.M.
View directions at: http://www.ubalt.edu/about-ub/directions/ . For more information, see below, or return to LLAMonline.org . Email James Durham at james.durham@mdcourts.gov if you have any questions! Bhel Puri – Puffed Rice, Sev (Chickpea Noodles), Tossed with Mild Chilies, Vegetables, Chopped Cilantro, Cumin, Lime Juice, Sweet and Tart Chutneys. Hope to see many of you at the AALL Annual Meeting being held in Boston, MA from July 21 through July 24 at the John B. Hynes Veterans Memorial Convention Center (there are two Conventions Centers in Boston). The theme this year is “Learn, Connect, Grow”. Please remember to take notes at your favorite sessions so you can share with all of us in the next LLAM eNews. LLAM will be having their usual table in the Exhibit Hall at the Convention Center in Boston. There are still a few slots that need to be filled. You can go directly to this doodle calendar to sign-up or contact Mary Jo Lazun (mjlazun@mdcourts.gov). The 2012 “Call for Papers” has begun! Student Division: Participants in this division need not be members of AALL. To be eligible in this category, you must have been enrolled in law school, or in a library school, information management, or an equivalent program, either in the Fall 2011 or Spring 2012 semester. The winner in the Open, New Member, and Student Divisions will receive $650 generously donated by LexisNexis, plus the opportunity to present the winning paper at a program during the 2012 AALL Annual Meeting in Boston! Winning papers are also considered for publication in the Association’s prestigious Law Library Journal. Short Form Division (NEW FOR 2012)! Articles in this category will be shorter than a traditional scholarly article, and appropriate for publication in AALL Spectrum, a bar journal, or a chapter or SIS newsletter. Participants must be AALL members. The winner will be awarded $300 from LexisNexis. Articles in the Open, New Members, and Short Form Divisions must be submitted by March 1, 2012. Articles in the Student Division must be received by May 15, 2012. AALL’s Continuing Professional Education Committee presents the AALL2go pick of the month: Reinventing the Law School Library. What do we, as law librarians, envision for the law library of 2020? Will it be a mere shadow of what we know today, or will it not have changed as drastically as we might think? This presentation is a panel discussion that addresses the idea of the law library in the year 2020. Each panelist speaks regarding different facets of what makes the library and how things may change over time. The idea of the library as a physical space is mentioned, as well as the notion that law libraries may eventually be defined by the librarians rather than the physical space the law libraries occupy. Library collections are discussed, bringing up such topics as the change in formats to digital collections, as well as the access and ownership issues that follow. The final panelist proposes the idea that there may not be as much change as we anticipate due to budgets and the current disconnect that is common between services provided by law libraries and the profiles they carry. With this comes the idea of switching the focus of librarians as service providers to becoming more proactive partners with faculty members and the resulting benefits of doing so. All these notions combine to provide a thought-provoking session about the future and direction of our law libraries. Find this and other free continuing education programs for AALL members on AALL2go. I am very excited to announce the launch of AALL’s new Legislative Action Center. The new Action Center gives AALL and chapter members the tools to easily send targeted messages to your Members of Congress, look up information about your elected representatives, and share our alerts with friends and colleagues through email or social media. This new resource will make it easier than ever before to speak out on the critical information policy issues that affect law libraries. Please use our Action Center to respond to our current alert on GPO funding. The alert allows you to use our template to send detailed messages to your Senators and House Representative and personalize your emails with stories and experiences related to FDsys and the Federal Depository Library Program. Your personal experiences and reasons why funding cuts would hurt your lawmakers’ constituents are extremely persuasive and will catch the attention of your lawmakers and their staff. Letters to all Senators, and House Representatives on the Legislative Branch Appropriations Subcommittee, are urgently needed. Thank you to all of you who have already taken action.